Contact us now for the best price on our River Findhorn Rafting trip. 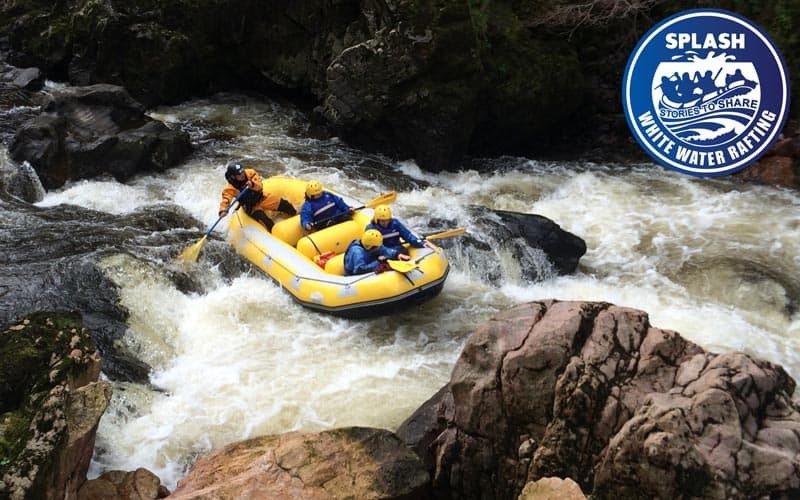 White Water Rafting on the River Findhorn, Aviemore, Scotland truly is something special. A true river for the adventurous, due to this the age of participation is strictly 18+ years of age, Adults Only. 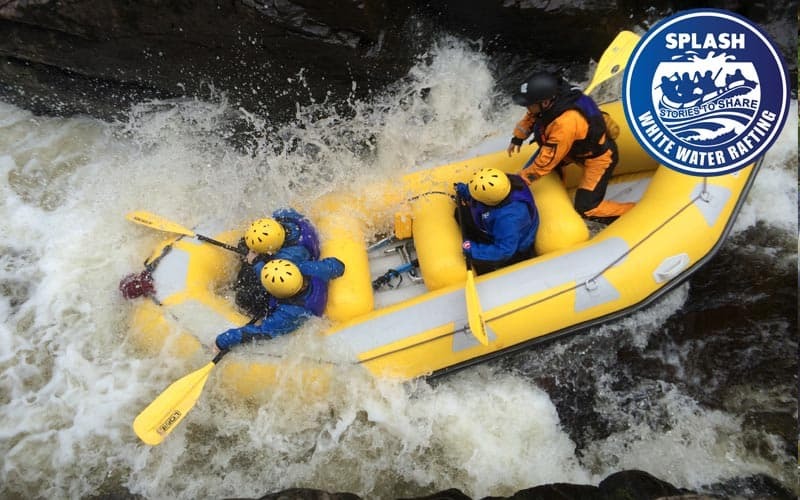 The Findhorn is recognised as one of the best section of river in the UK for both white water rafting. The River Findhorn has the record for the largest recorded flow in the UK, this happened in the flood of 1970. The river is no stranger to high flow with the history books showing the river flooding back in 1829, where the river filled the valley, 200 yards wide to a level of 50 feet above the normal height of the water. This is thought to be the largest UK flood ever! This section of the River Findhorn is a full day trip. It is a once in lifetime rafting experience. The river takes you through what has been said to be the some of the most exquisitely picturesque and exciting stretch of the river in the land. This section drops steeply for around 3.5 miles (5.5km) starting just below the misnamed Randolphs Leap, an opening of rocks, roughly eight feet in width, tearing its way amid granite cliffs dashing over great boulders and swirling foaming pools. We negotiate a couple of minor rapids and an island before passing Logie Estate House and dropping into the intimidating yet spectacular gorge. Major rapids such as the Side Winder, Triple Falls, Cork Screw as well as the Slot have to be negotiated. You then pass under evidence from the last major high water, which has left a 30 foot long 5 foot thick Caledonian Pine stump straddling the gorge. The final stretch flows through wonderful granite serpentine. This passage opens out suddenly to reveal a dramatic geological change to red sandstone cliffs releasing you from the grip of the Lower Findhorn Gorge. For members of your group or family who would rather chill, Logie Steading has a craft, art and bookshops, a superb café and children’s playground. Scenic walks are abundant. Combine your Splash activity and save! Why not try out another river rafting, river bugs or river duckies? A full day of adventure on the river and in the canyons cost from just £85 per person – guaranteed excitement and exhilaration suitable for the whole family! 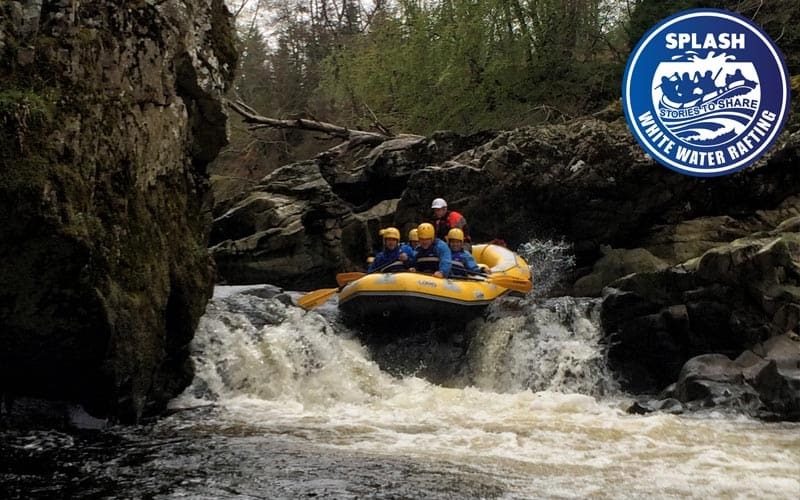 Between June and September Splash offer white water rafting on the River Tummel, Get in touch with Splash by calling (01887) 829706 now and we’ll get you booked in. Of course, if you prefer to experience adventure on land, we can offer fantastic activities including paintball, abseiling, quad biking , off Road Rage buggies , Clay Pigeon Shooting or even bungee jumping! We have lots of accommodation partners in Aberfeldy and the surrounding Perthshire area. We can provide 4 star Hotels all the way through to camping to accommodate everyones budget and choice. On every rafting trip, we include all equipment required plus a professional experienced guide. A logistics manager on land who is also a very experienced guide. All equipment required which includes over £150 worth of wetsuits, helmets, lifejackets. Transport from our base on and off the river/ canyon by a professional bus company. You will be provided with everything you need to rafting safely. However we do ask you to bring an old pair of shoes to wear on the river (These will get wet), and your swimwear for underneath your wetsuit. Optional – a non-cotton T-shirt (synthetic materials are best ) for under your wetsuit. Depending on the time of the year warm clothing for before and after your trip. Contact us now for the best travel information and meeting location for your River Findhorn Rafting trip.